Formulation: A soothing combination of olive oil, beeswax and mineral pigments nourish and bring color to the skin for a sheer, sun-kissed appearance. Anthyllis and witch hazel tone and visibly firm skin. My favorite. I often put it on even for at home days, because it feels nourishing and healthy. As for those who feel it is too orange, I can see that maybe with a really white complexion, but I encourage massaging it into the skin. It evened my tones and gave a hint of having been in the sun, without looking like I did anything. Kind of criminal, to look like I have skin that looked that much better naturally, with nothing on. I love it! No one else has anything else like it. I suspect having a tone a little lighter for really white beautiful skin, would be nice, with all the same lovely healthy things in it, sans the color -- would be fabulous as well. I would probably have to try it also! I feel that this product helps keep my skin clear and radiant -- I know, sounds like a commercial, but nothing else is so health promoting in this category, in my opinion. I am so happy to have been introduced to it at my local natural foods co-op. It is perfect skin tone to add to anything, in the intensity I need, little or a lot. Thank you. Feels like Im wearing nothing, but in the mirror, it looks polished! Great product that provides just the right amount of color. I first purchased the Translucent bronzing in the whole body section at Whole Foods- more than 4 years ago. I'm an American black woman and as with most areas in life wanted to do better with cleaner make up. It is very light coverage, but enhances brown skin and creates a space for forgiving a pock mark from childhood chickenpox and gives a smooth cappuccino richness....I'm in love...try it. I love the subtle color it gives my face. I just add a little bit to my moisturizer and blend. Looks natural on my olive-toned skin. Work perfectly for my skin type, which also has a bit of sensitivity. Exactly what I needed - a bit (or more if I want to) of color. Totally recommend it! I was mostly intrigued by the fact that the ingredients are amazing. I do not wear makeup when I don't need to, because I try to do the least amount that I can to my skin. With this, I never worry of it congesting my sensitive skin. It blends beautifully, and looks great mixed with oil. But, I find that it doesn't mix with creams well and it's a bit red for fair skin. I try not to apply it towards the center of my face because it makes me look a little sun burned. Maybe on different skin tones? Over the past year I've integrated all Dr. Hauschka products in my skin care and now my makeup regime, so I was very excited when I finally started using the bronzing tint. The coverage is light and sheer and it blends easily with moisturizers and even the Hauschka foundation. I am disappointed how easily the tint in the cream wears off onto clothes, hands, etc. Pros: Overall, it works well for what we want it to do. I've read a lot of the other reviews. For those saying the color isn't right- the point of the product is to mix it in with your daily moisturizer, adding a little or a lot depending on your skin tone. You will get used to it and know how much or little to add. Once you do, you will see it is great! It is easy to apply and definitely gives that sun-kissed glow! Just work on the cons I mentioned, PLEASE. Sorry to hear you are not 100% satisfied with your purchase. If you'd like further assistance, please give us a call at 800-247-9907 9am-noon and 1pm-4:30pm Eastern Standard Time, Monday through Friday. I mix it with my moisturizer. It is light and provides very even toned sheer glow. I does soften the appearance of blemishes and imperfections as the description says. no matter what moisturizer I use I always mix this with it. I started using it after I read the ingredient list..it is a good formulation. I really like this. It smelled so good. I have used it alone after moisturizing as well as mixed in my hand with my moisturizer. It gives a nice sun kissed brown tone without looking orange. This is a great product. Would LOVE LOVE LOVE to have a large bottle for entire body.. I am fair skinned, so this looks a bit dark on me. I do like the concept of it and it feels nice on my skin. It doesnt really have any coverage if you are looking for that, but does give nice color. Probably better for someone with a little bit darker skin. I hesitated initially to buy this because I worried that it would not be a smooth transition where it was applied. I was wrong, and it totally did. It is light and sheer. It's great for a little glow. I tend to use it more in the summer, when glowing is more natural in this Michigan climate. Sometimes, I even mix it with my lotion if I want to go foundation-free for the day. I tried this after completing the skin consult questions. I figured out how to use a minimum mixed with moisturizer as to make it light enough. I like the natural look it gives with a hint of color. I’ve been using blushes and bronzer powders to get some color and definition to not look like stale bread. I decided to try this bronzing tint in my last purchase and my goodness, did it work nicely in place of where I would normally color with blush. 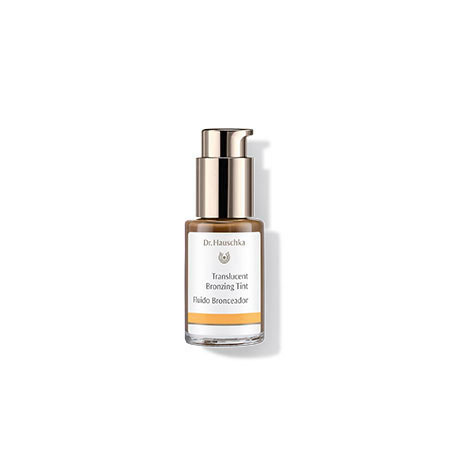 It blended with my Dr. Hauschka foundation splendidly. I had color, yet as opposed to my other powders, it looks natural, and made my skin feel clean. I use the Translucent Bronzing Tint instead of foundation. It gives me a nice glow, as if I've been in the sun, but it doesn't cover my healthy, mature skin. It does dissimulate some discoloration. I mix it with my moisturizer and if I'm wearing makeup, I use it for contouring. It has a slight, pleasant fragrance. I love using the Translucent Bronzing Tint mixed with Dr. Hauschka's foundation. I combine Translucent Bronzing Tint with Quince or Rose Day Creams. It imparts subtle coloring and healthy radiance to my complexion. Excellent fluid texture. Economic as a little goes a long way. A fine product that feels agreeable on my skin. I do not really like the fell of makeup on my skin nor the hassle of applying it. This product gives a subtle coverage and you can add it to any type of moisturizer. It gives my face a bit of color, is light and natural, and evens out my skin tones! Love it! I kind of like it - only used it a few times as it is dark for my skin tone and seems thick - hard to even out. I tried mixing it in with my day cream and that helped some. It's fun for a change and a pick me up for color as winter approaches. It does not seem to make me break out like some bronzers. This together with tinted moisturize and I do not need foundation! I use this every morning withTinted Day Cream. Just a drop of each I mix in my palm this brings great hydration. I never used Foundation, but this really works for small imperfections. Absolutely love this product. Very nice product, smells and feels nice on my skin. However, the color just does not work. Gives a brownish tone rather than sun kissed. Disappointed. I love mixing this with the Body Lotion. It gives your skin an amazing glow as if you have been kissed by the sun.... I suggest mixing it with a lotion to lighten the tone. Love adding this to any base lotion or the face oil throughout the year for a great tone. Have been using this product for 10+ years. Fantastic Color and Natural-Looking Coverage! A wonderful product to mix with any face cream or an added umph to my tinted moisturizers. Perfect gradual, natural-looking color especially during my pale winter months. Adds life into my skin! Gentle formula works well and removes easily with my face wash. A lifesaver. Lovely glow lasts all day. Mixed this in with my translucent face tint during late spring and summer. Great glow! I had pick this up at my local health food store (W/F) I am so Happy I did I just Love it! a little go's a long way. I wear it by its self mixed with my face oil moisturizer it evens out my skin and my pores are gone, or I wear it as a bronze look as an eye shadow it is so diverse! if I'm wearing it on my face all over, I also apply it to my neck and decollete or any where you would like to your body to glow arm, legs ect. I'm fair in completion with golden undertones. a must have! I really like this product, goes on sheer and light with just enough bronze and applies well to any makeup I place on top of underneath! I'm in love. This feels very light on my skin. I like the idea that I can adjust the tint of my makeup at will. Please bring back the Translucent Foundation…#2, specifically. It was such a great product for my skin type and color. It was also great for protection again the sun and weather elements. The Bronzing Tint might sound great in concept, however, it is very cumbersome to prepare and apply to skin. Also, the bronze tint makes my skin tone look harsh and adds a yellowish-brownish tint, even with the least amount possible. And, where the Translucent Foundation helped to cover some skin discolorations, this bronze tint does not. Please, please bring back the Translucent Foundations. I love your products - Foundation, especially - and I don't want to have to shop around for another product. I don't like foundation. This tint adds some color without feeling like you're wearing makeup. Blends easily w moisturizer! A product I can use in a creative way! I absolutely love this product. I am 65 and have gone through extensive chemo treatment that has really affected the appearance of my skin. In addition I am fair skinned, blue eyes and now silver grey hair. I never go out outside without using a broad spectrum zinc oxide sunscreen cream that is a very thick opaque white cream. I now can blend the Translucent Bronzing Tint with the zinc and it goes on smoothly and enhances my skin color. The white zinc color has been replaced with a flattering light bronze. I might add that it does not settle into my age lines by using a little blotting before I add a translucent powder to fix in place. When a product enhances your beauty it becomes an essential makeup product. Translucent Bronzing Tint can be mixed with any Dr. Hauschka moisturizer, including face, body and eye creams and Clarifying Day Oil. Color intensity depends on the amount of tint added. Blend 1-3 drops with moisturizer and dab on skin to test color. Add more tint or moisturizer to adjust color before applying to skin. For a matte appearance, we recommend applying Translucent Face Powder, Loose or Compact over Translucent Bronzing Tint. Those with dry, sensitive and normal skin, will also appreciate Tinted Day Cream, a nourishing tinted moisturizer.